Danny Graham scored the 150th goal of his career as Blackburn all but extinguished Nottingham Forest's faint play-off hopes with a rare away win. Rovers started the brighter and moments after Elliott Bennett's effort was deflected just wide, Joe Rothwell curled a finish into the far corner after Derrick Williams' header was cleared off the line by Jack Colback. Graham doubled the lead, pouncing from close-range following a Sam Byram mistake, but Forest hit back almost immediately when Ryan Yates bundled in after a mistake from keeper David Raya. Darryl Murphy could have grabbed a late equaliser, but scuffed his effort wide as Rovers held on for only their second win in 15 away league outings. Blackburn had seen their play-off hopes snuffed out by a poor run of results, having been just three points outside the top six at the start of February, while a home win was crucial for Forest just to maintain an outside chance of a top-six finish. But despite a woeful recent away record which had brought nine defeats in 12, the City Ground continued to be a happy hunting ground for Rovers who made it eight wins in 14 visits, and extended their unbeaten run over Forest to eight matches. Having created little, Martin O'Neill's side responded well to falling behind, with Pelé winning possession and putting Lewis Grabban clean through, but Forest's leading scorer, who has just two goals in his last 16 appearances, dwelled on the chance, allowing Amari'i Bell to challenge. It was Forest's home form, with five wins in their last six, which had kept them on the play-off fringes, and they created enough chances to extend that run, with Matty Cash heading over Byram's pinpoint cross shortly after Yates' scruffy goal. But they also had Costel Pantilimon to thank for denying Tony Mowbray's side a third, saving well when one-on-one with Bradley Dack whose follow-up shot was deflected onto the bar. 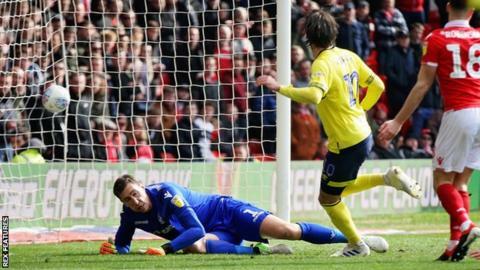 Defeat kept Forest in 11th, eight points adrift of the final-play-off place with four matches left, while Blackburn moved up a place to 15th with their third win in six. "We had glorious chances today and spurned them all, apart from one, obviously. "The game should have been out of reach. They were really good chances, but we spurned the lot of them. It is poor on our part. "The play-offs are a distance away and we cannot talk about that any more. Now we will see what we have about us. "Everyone will get a chance to show what they can do and we will get ready for next season." "We feel as though we have let ourselves down a bit over the last two months, because we were on the cusp of the play-offs. "But for the last 11 games, we had won one match. We had a soft underbelly and were letting too many goals go in. "We have our own ambitions, which we have fallen away from. "We have plenty to build on, we will look to strengthen in the summer again now. Let's see how we go." Match ends, Nottingham Forest 1, Blackburn Rovers 2. Second Half ends, Nottingham Forest 1, Blackburn Rovers 2. Foul by Ben Brereton (Blackburn Rovers). Derrick Williams (Blackburn Rovers) wins a free kick in the defensive half. Molla Wagué (Nottingham Forest) wins a free kick in the defensive half. Attempt missed. Joe Lolley (Nottingham Forest) left footed shot from outside the box is too high. Attempt saved. Joe Rothwell (Blackburn Rovers) right footed shot from the centre of the box is saved in the bottom left corner. Attempt missed. Joe Lolley (Nottingham Forest) left footed shot from outside the box is close, but misses to the right from a direct free kick. Delay in match João Carvalho (Nottingham Forest) because of an injury. Delay in match Amari'i Bell (Blackburn Rovers) because of an injury. João Carvalho (Nottingham Forest) wins a free kick in the attacking half. Substitution, Blackburn Rovers. Ben Brereton replaces Bradley Dack. Delay in match Molla Wagué (Nottingham Forest) because of an injury. Attempt missed. Joe Lolley (Nottingham Forest) right footed shot from the centre of the box misses to the left following a corner. Attempt blocked. Daryl Murphy (Nottingham Forest) left footed shot from the centre of the box is blocked. Assisted by Joe Lolley. Attempt blocked. Jack Robinson (Nottingham Forest) left footed shot from the left side of the box is blocked. Corner, Nottingham Forest. Conceded by Darragh Lenihan. Foul by Jack Rodwell (Blackburn Rovers). Attempt missed. Joe Lolley (Nottingham Forest) left footed shot from the left side of the box misses to the right. Assisted by Jack Robinson. Foul by Derrick Williams (Blackburn Rovers). Attempt saved. Adam Armstrong (Blackburn Rovers) right footed shot from the left side of the box is saved in the centre of the goal. Assisted by Bradley Dack. Joe Rothwell (Blackburn Rovers) wins a free kick in the defensive half. Substitution, Nottingham Forest. Ben Osborn replaces Ryan Yates. Offside, Blackburn Rovers. Lewis Travis tries a through ball, but Joe Nuttall is caught offside. Corner, Blackburn Rovers. Conceded by Daryl Murphy. Substitution, Nottingham Forest. João Carvalho replaces Lewis Grabban.